In celebration of the first anniversary of the New Order, we've been counting down the Top 15 MinerBumping posts. Click here for #15-#11 and here for #10-#6. And now, the conclusion. Did your favorite MinerBumping post make the list? Find out! My first job as a diplomat didn't go very well. 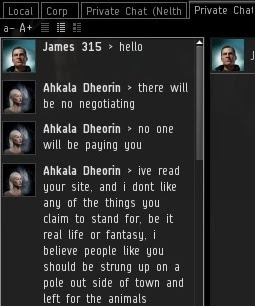 My mission was to help Ahkala Dheorin make peace with Arctic Dungeon corp, which was prosecuting a wardec against her friends in the name of the Code. Though I wasn't able to negotiate the terms of her surrender that day, Ahkala taught me an important lesson: Even people I've never met can direct a surprising amount of venom against me, simply because they encountered Agents who did work in my name. The story had a happy ending though, because Arctic Dungeon's fine work forced their surrender. #4. 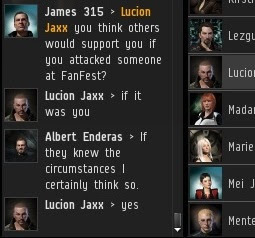 "Avenging Bumps at Fanfest"
The peace-loving, tolerant, EULA-compliant carebears of highsec just want to be left alone. They like to mine because it's relaxing. At least, that's what they claim. In reality, the carebears are the group of EVE players most prone to hostility, blind rage, and threats of out-of-game violence. No wonder they seek relaxation--they're sorely in need of it. Lucion Jaxx became the first of many carebears to share his TOS-breaking fantasies in local. Though the miners of highsec are often dismissed as oblivious AFK'ers who have no concept of anything outside of the chunk of rock they're shooting at, they occasionally experience a "eureka" moment. When the New Order first got to work saving highsec, carebears quickly grasped the implications of having a bunch of players suddenly attacking their bot-aspirant lifestyle. They weren't happy. In this post, miners reacted to the sight of a small group of bumpers working together. They realized bumping would become a trend, and they pitched a bit of a fit about it. It was brief, but New Order vets have fond memories of our war against the Torarjan Collective corporation. The New Order is never better than when it is standing up for the little guy in a fight against an oppressive organization that hurts new players. Professor Billions appealed to me for help when he was kicked out of his corp for putting a pledge of loyalty to me in his bio. I got in touch with the CEO of the corp, but he was dismissive. In this post, I called the New Order to action and declared a crusade against the corp, encouraging all Agents to defend the rights of men and women to follow the Code. Torarjan Collective's CEO vowed never to surrender or shed carebear tears. You know how this story ended: They shed carebear tears and then surrendered to us. 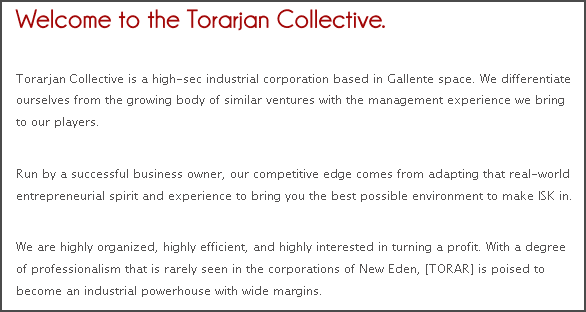 Torarjan Collective disbanded and its CEO abandoned his dreams of building a giant mining corp in highsec. Surprised? I didn't think so. The #1 post earned its spot on the countdown not so much for the tears in the post itself--which is there to provide background information--but because of the SoundCloud recording of Mine Teck that was contained therein. It became an instant classic. If you haven't listened to it yet, now you know how to spend your next 18 minutes. 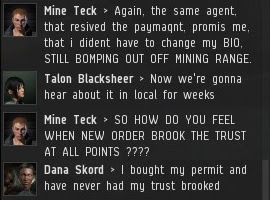 Mine Teck, a Danish ice miner, joined Fawn Tailor and several other Agents in a TeamSpeak channel to discuss Mine Teck's problem with the New Order. Like a good film that stands the test of time, several memorable quotes originated from that recording. If you're ever in need of a smile, listen to the recording and you'll be beaming in no time. And that's what it's really all about, isn't it? The New Order brings joy and smiles to every good person in highsec. Here's to the New Order, and may every year be filled with as much jubilation as this one! That's a veritable treasure chest of gold right there! Priceless. I figured Mine Teck would be #1, but I liked a couple other ones better. If we could only somehow arrange for Mine Teck and Moonsong Miner to hook up... something truly wonderful could happen. Or the server would explode, take your pick. Also, life as we know it may also end. So that's where the Toledo Guard Went. Always wondered how they disappeared from the EVE-O Forums. The Tolero Guard forum thread lives on in C&P, a trophy for the New Order. LMAO at MineTeck. That was always good for a laugh. That being said however. It also proves how base you are as a self-professed "savior" of hi-sec. I am sorry, I respect many of the things that you do, but 1. I do not have a permit even though I do occasionally mine as I simply put don't like your style, 2. I do not agree with all you say, although I do agree with much of your idealogy. 3. MineTeck was a bit over the top, but nobody deserves to be ridiculed and demeaned in such a fashion. Return the anger, derision and scorn with respectful strength and one will always triumph. On a sidenote, what happened to you guys? I used to see you active across high sec, now I never see an agent at work and all the miners I see are non-compliant. Well, fads come and go I guess. Somehow the #1 spot still doesn't do the Mine Teck saga justice. As a late-comer to minerbumping I read the whole Mine Teck saga from start to finish in one sitting and it was one of the funniest things I've ever read. 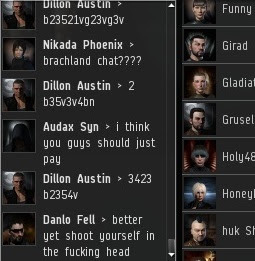 These are all classics, but my favorite episode is that one where I made 400 mil ISK.